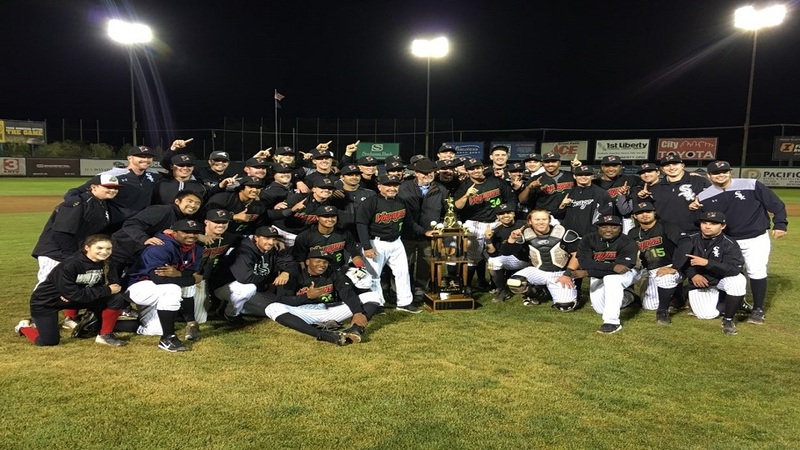 Great Falls, MT-After a delayed start due to rain, the Voyagers plated five runs over the first three innings to beat Grand Junction 6-4 in game two for a clean sweep of the Pioneer League Championship Series Thursday night at Centene Stadium. Great Falls (2-0) captures its first league championship since 2011, and the third since becoming a Chicago White Sox affiliate back in 2003. Grand Junction (0-2) was playing in the league championship series for the first time in franchise history. The Voyagers opened the scoring with a single run in the bottom of the first. Lenyn Sosa banged a one-out triple off the wall in left-center. Sosa scored on a Romy Gonzalez RBI single lined into left. Great Falls extended the lead to 4-0 with a three-spot in the second as eight batters came to the plate. Ryan Fitzpatrick and Gunnar Troutwine led off the frame with singles. Micah Coffey walked to load the bases. Travis Moniot smacked a double up the right field line that scored both runners. An RBI groundout from Lenyn Sosa capped the inning. A run in the home half of the third pushed the lead to 5-0. Bryan Connell started the inning with a single to right. With two outs, Micah Coffey brought Connell home with an RBI single lined up the middle into center. Grand Junction finally broke through with a two-run fifth. John Cresto reached with a groundball to second that resulted in a throwing error to first. Will Golsan coaxed a one-out walk. Hunter Stovall drove in Cresto with a base-hit to left-center. Golsan later scored the second run on a wild pitch. The Rockies closed the gap to 5-4 with two more runs in the top of the sixth. Niko Decolati singled to left leading off the inning. Javier Guevara reached with a one-out walk. John Cresto followed with a single to center. Pinch hitting, Reese Berberet grounded into a 6-4 fielder's choice that ended with a throwing error to first. Decolati and Guevara both scored on the play, with Berberet credited for an RBI on the first run. The Voyagers scored an insurance run in the eighth with a two-out rally. Romy Gonzalez singled to right and stole second. After Bryce Bush walked and Grand Junction made a pitching change, Amado Nunez singled to left for the game's final run. On the mound, Codi Heuer posted the win in relief after starter Jonathan Stiever held the Rockies scoreless for three innings. Heuer (1-0) worked two-and-two-thirds and gave up four runs (two earned) on five hits with four strikeouts and two walks. Trent Fennell took the loss for Grand Junction. Fennell (0-1) lasted just one inning and allowed four earned runs on five hits with three strikeouts and two walks. Devon Perez was electric over the final three-and-a-third to close the game and earn his first postseason save. Perez yielded three hits and struck out seven, including the side in the ninth to end the game. Great Falls outhit Grand Junction 12-to-11. Romy Gonzalez went 3-for-3 with a double and reached four times. Travis Moniot and Lenyn Sosa both bagged two hits. Moniot drove in two. Sosa picked up an RBI with one run. Great Falls won the 2018 league championship one season after losing to Ogden in the title round in three games. 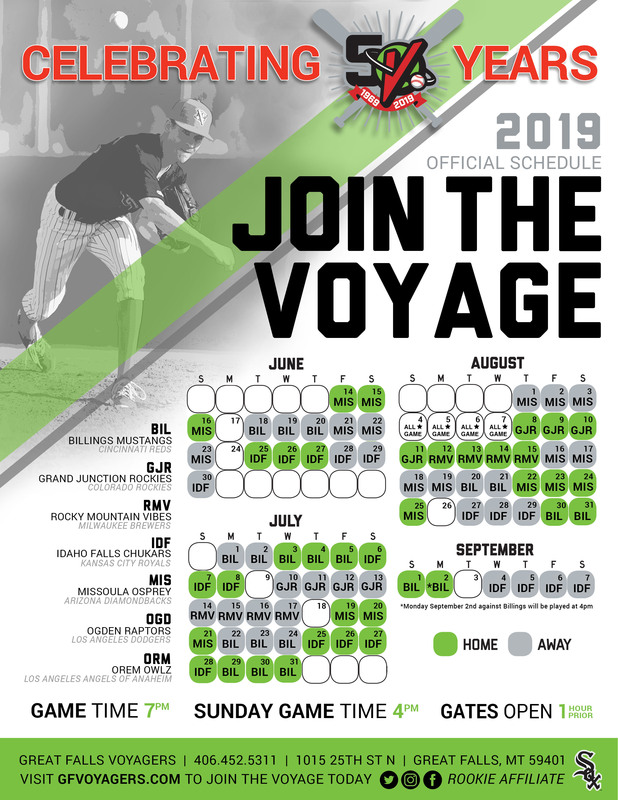 The Voyagers begin a new Pioneer League season in June 2019. For season tickets and promotional information, call 406-452-5311 or visit www.gfvoyagers.com.